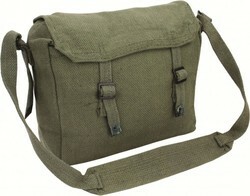 A retro army style small canvas shoulder bag with one main compartment and adjustable straps. New condition in original wrappers. * Postage costs are for UK mainland postage for single item unless otherwise stated. I am so impressed with the quality and service you guys provide me with every time I call or order! I love the quality of the kit, it is brilliant and I have never had cause to fault any of the kit you have provided me with! Excellent, second to none, Strikeforce is my one supplier now!